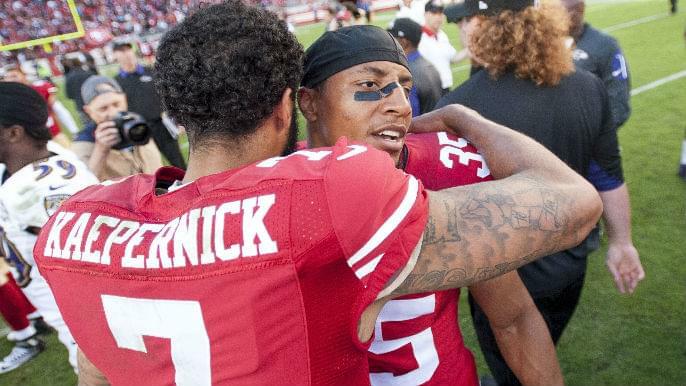 When Colin Kaepernick and Eric Reid agreed to resolve their collusion grievances against the NFL last month, the payouts were expected to be massive. NFL reporter Mike Freeman said league officials estimated Kaepernick would receive anywhere from $60 million to $80 million. That apparently won’t be the case. According to a Wall Street Journal report, Kaepernick and Reid will receive less than $10 million. In October of 2017, Kaepernick filed a grievance against the NFL, stating that multiple owners colluded with each other to prevent Kaepernick from rejoining the league. Fast forward to May of 2018, and Reid, also unemployed at the time, filed a similar grievance. These decisions stemmed from the backlash following Kaepernick’s and Reid’s joint decision to protest racial injustice and police brutality by kneeling during the national anthem, starting early in the 2016 season. The movement gained momentous traction across the league and inspired athletes in other sports to take similar stands. But Kaepernick’s and Reid’s roads to employment have been bumpy in the aftermath. After playing the first five years of his career with the 49ers, Reid signed with the Carolina Panthers three weeks into the 2018 season. In an 11-week timespan, the NFL drug-tested him seven times, which raised more questions. Last month, Reid signed a three-year extension with the team. Kaepernick has not played since the 2016 season. He has since become the face of Nike’s “Just Do It” Campaign.